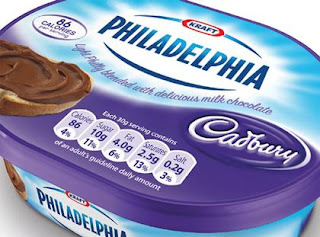 I ♥ Motherhood: Philadelphia with Cadbury - Choccy Philly! This week I was invited to the launch of the new Philadelphia Flavour. It was all top secret before I got there and I had no idea what to expect, honestly I thought it would be another savoury flavour. We've recently been eating and loving the Sweet Chilli one. So Isla and I set off to London to go and meet everyone and find out what it was all about. The location for the launch was fantastic and on reflection was a slight clue to the unusual new flavour to hit the Philadelphia range. It was at Ripley's Believe It Or Not Museum in the heart of Piccadilly Circus. I've not been to Piccadilly Circus in ages and I'd not heard of Ripley's, but its a brilliant museum full of exhibits, some unbelievable, some extraordinary and others unusual. When we were shown into the room where the launch was taking place, all was revealed and you should have seen Isla's face. It was almost wall to wall chocolate! There were digestives with Choccy Philly on, Brioche with Choccy Philly, Choccy Philly with Strawberries, Choccy Philly on rice cakes, croissants etc etc. It was everywhere and I couldn't stop Isla from sticking her finger in it wherever she could (sorry everyone)!! As she was the only little one there at the time, she was in danger of stealing the limelight from the Choccy Philly, the photographer kept snapping away at her and for once she was getting really into having her photo taken, unlike when I try to take a snap of her! ﻿What did we think? Isla loved it. Rather too much. The fact that it is a cheese/chocolate combo would never even occur to her as she's too young and I think that just shows if you have no notions about combining the two then you won't even hesitate to try it. For some people though the very idea is a turn off but let me tell you, it's only really like cheesecake. To me it tasted delicious and the idea was mentioned about using it as a cake frosting which really makes sense. It's got a great consistency and would be perfect for that. I also think that it does give a good hit of chocolate, so say when you haven't got any Dairy Milk in the house, Choccy Philly on toast would be good. ﻿﻿ Our verdict is that it was delicious! Thank you for inviting us, we had a great time! The facts: At 86 Calories per serving, Philadelphia with Cadbury is less than half the fat and has less sugar than many other chocolate spreads. It is available from this month in the shops and is £1.62 per 160g tub. Packs of 4 mini tubs are also available. It is a refrigerated product unlike other chocolate spreads.